Curry leaves are aromatic dark and shiny leaves used in Indian cooking and is an integral part of a lot of curries, hence the apt name, curry leaves, I guess :-) For generations Indian families have used these leaves for their digestive properties as part of home remedies for digestive disorders. These leaves are also said to help in preventing premature gray hair and various sundry health benefits. When I was younger, I used to carefully remove the leaves that were used as part of seasoning in a curry and keep it aside even though I was told they were good for me, I never really seemed to care for it very much. But now as with many other spices and herbs I avoided earlier, I find myself re-looking these leaves too and they have become a constant part of my kitchen now, in one way or the other they find a presence in a lot of my dishes. I knew that a spiced curry leaves powder was made in my home when I was younger but I never got around to making it since it requires a large quantity of curry leaves and finding them in such quantities in Indian stores is quite difficult, not to mention pricey. So the other day when I was shopping for groceries at the local Indian store I happened to see dried curry leaves being sold there, reasonably priced and definitely more long lasting then the fresh ones I usually buy. I bought that and have been using it in my cooking for a while now and do not find any discernible difference in taste from the fresh ones. 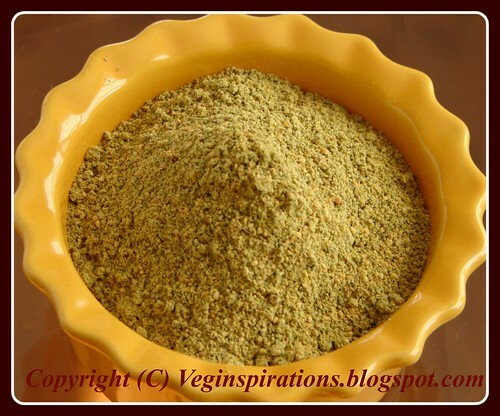 Spiced curry leaves powder is a dry powder that has a long shelf life. It is versatile enough to be used as a side with some rice dishes like yogurt rice, or it can be mixed up with a little bit of cooked rice, add a few drops of clarified butter/ ghee or sesame oil and voila you have an instantly flavored healthy rice dish. This powder can also be used to spice up yogurt to create an instant dip, or to spice up curries. Simply put, this versatile and healthy powder manages to find its way to the dinner table one way or the other almost each day. Dry roast each of the lentils seperately until it turns reddish, keep aside seperately. Dry roast the red chillies until they turn color and keep aside. Powder the split chick pea until slightly coarse, then add split black gram lentil to it and continue to powder until they get the bread crumb type look, keep aside. Powder they curry leaves into a fine powder and keep aside. Powder the dry red chillies with a pinch of salt if required until reasonably fine and keep aside. Now mix all these powdered ingredients together in a blender, add salt and asafoetida and powder until fine. Dry roast a small piece of tamarind and powder and add to the spiced powder and mix well. I did the same as u did when i was young...lovely curryleave podi.. I cannot cook without these leaves! Thank God I ve a plant too:) The powder is sure aromatic and tasty! I too make it the same way but not used black gram..Looks nice , aromatic powder !! Wow this looks great and yum yumm...I always love podi , ghee with hot steamed rice. multipurpose podi actually..i will make this sometime..
i love the smell and flavor of curry leaves! Lovely Karuvepillai Podi Recipe!Picture looks awesome. I wasn't a huge fan of eating curry leaves when younger either, but developed a taste for them later in life. They're really good for you. I love this curry leaf powder-- sounds delicious. rich colour to your podi. I can sit here smelling the flavours. lovely pic! Grown up having it almost everyday. Happy dusshera to u and ur family usha! I liked your blog very much. You have presented very beautifully and curry powder looks very nice. You are welcome in my blogs. Wish you a very Happy Dussehra. Lovely curry powder. Always learning when I visit you x.